Warm wool reversible Blanket coat, separate lined pockets on both sides. Nickel Silver concha snaps. This wool blanket has two colors. When reversed the pockets change to a welt.. Warm wool reversible Blanket coat, separate lined pockets on both sides. Nickel Silver concha snaps. This wool blanket has two colors. When reversed the pockets change to a welted slash pocket from the patch pocket. This coat pattern is a boxy styling and will be a little larger then you might expect if you wear more form fitting coats. This is not a product of Pendleton Mills, rather it is constructed from their excellent shawls and robes. 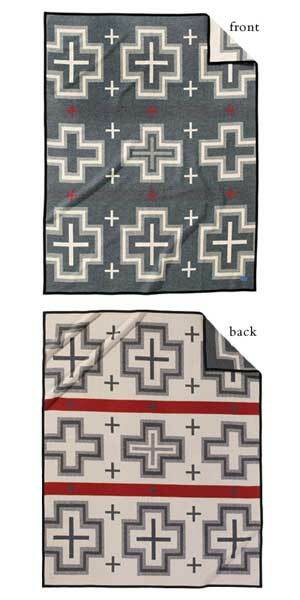 Sewn in Gallup, New Mexico, USA by our very skilled Navajo staff. Click Add to Bag tab to select blanket pattern and color choices, and choose from sizes before ordering. Contact us for order assistance 800-377-6837. Our sales staff will be happy to answer and concerns you have.